Tabor Ulrich thinks the world will soon be his plum. 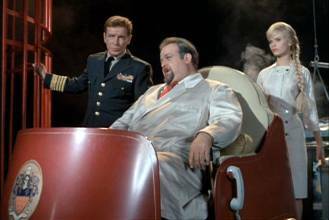 Wheelchair-bound genius (albeit a demented one) Dr. Tabor Ulrich lures Nelson to his bionics laboratory under false pretenses and proceeds to steal all of his knowledge and transfer it into a Nelson cyborg duplicate. The machine, in Nelson's stead, returns to Seaview along with a compact supercomputer which is connected to the submarine's systems. Unknown to the crew, not only is their Admiral not who he seems, but all the sub's external sensor input is being controlled by Ulrich. The madman plans to blackmail the planet into a one-world government using Seaview's Nuclear arsenal as his lever. Ulrich, of course, will take over as leader. He informs the world of his demands, the governments of which react by sending every plane, ship and submarine in their arsenals after Seaview. Oops! Crane and company remain oblivious to all this thanks to the on-board super computer, which filters their incoming messages. Thinking they're following official U.S. orders, they head for launch coordinates to fire missiles, little knowing that the Nelson cyborg has targeted those missiles for Peking, Moscow and Washington. 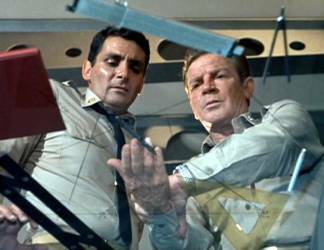 Things look bad until Nelson, with the help of an all-too human cyborg named Gundi, escapes his confinement and manages to use Ulrich's master control panel to force the Nelson cyborg to tap out a Morse Code warning of the plot to Crane. 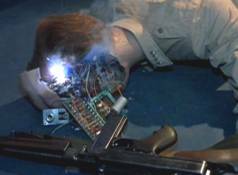 Gundi then instructs Nelson, who is unaware that Gundi herself is a cyborg, to fire into the control panel to destroy Ulrich's automaton army. The Admiral does so and the cyborgs fall to the floor, shorted out, no longer a threat. Nelson is dismayed when Gundi also "dies." An infuriated Ulrich comes after Nelson and during a struggle, is electrocuted and goes out in high melodramatic fashion. Back on Seaview, Captain Crane and crew destroy the now rampaging Nelson cyborg and stop the missiles before they can launch. The real Nelson later observes that the cyborg's weakness was the vestige of humanity imprinted from their human counterparts. 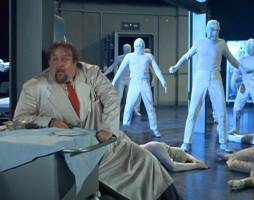 Victor Buono and his army of cyborgs. Written: William Read Woodfield, Allan Balter. 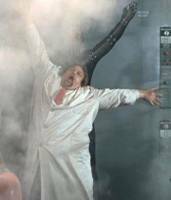 Mark Says: Dr. Ulrich�s remote mountaintop and his lab are well conceived and Victor Buono is an amusing villain. However, he plays it so large (no pun intended) that you can�t take him very seriously. His attempts to ignite WWIII are simplistic and a Seaview crewman�s dissolve into sheer panic is incredibly phony. The Nelson replica also seems contrived. The good moments include Brooke Bundy�s awakening humanity and Nelson�s motor-scooter escape from his prison but this remains a mediocre episode. 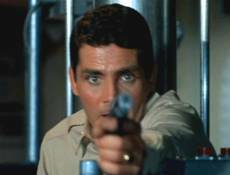 Mike Says: Voyage gets really stupid for the first time. Many fans like these kinds of episodes for their wacky goofiness. My apologies--I felt (and still feel) that they were a waste of the show's potential. By now, we were all aware of what the cast, crew and writers were capable of--a lot! 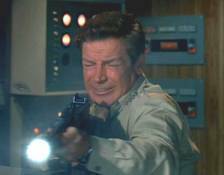 Although certainly not Voyage at its worst, it was this kind of pabulum that eventually killed the show. Despite Nelson's tacked-on comments about humanity, this episode is really the first Voyage that had nothing to do with making comment on the human condition, but rather existed solely for the purpose of providing over-the-top calisthenics for young eyeballs. Accepting Voyage's new direction as a Sunday night kids show, Writer William Read Woodfield had decided to take the money and run.